Kate Fagan and Kathryn Budig provide delicious takeaways and inquisitive moments around sports, lifestyle, wellness and their relationship. Free Cookies shares the trailer for Season Two of 30 for 30 Podcasts, launching November 14th, as well as one of our favorite episodes from Season One, On the Ice. Surprise! It's a bonus episode - who says no to Sue Bird? First, K&K grapple over who's responsible for a recent failed idiom (things escalate quickly). Then, WNBA superstar Sue Bird joins to discuss why people tear down women's sports, how stopping comparisons to the NBA might help, and her power couple status with USWNT star Megan Rapinoe. K&K head to Mexico, but not before a hopeful sit-down with Jamie Tworkowski on the importance of honesty and asking for help. Kathryn then interviews Kate on her upcoming book, "What Made Maddy Run," discussing suicide prevention and mental health awareness. Finally, a thank you to Cookie Monsters for an incredible first season. K&K talk NFL franchise tags and share times when they took a chance on themselves. Then mind-body fitness founder of "The Class by Taryn Toomey" brings her no BS approach to wellness and crushing your inner critic. Finally, K&K share something that may be better than lattes. K&K talk NBA free agency. Then, things get naked as they go sans guest to answer Cookie Monster (read: listener) emails while tackling gender and sexuality stereotypes. K&K get scientific about which sport is best suited for their body types, and no, you wouldn't have guessed them. The OG of yoga, Seane Corn, discusses the importance of giving back, living with vertigo, and her amazing hair (ok, ok, Kathryn talks about that part). K&K discuss their career game-changers and consider an International Cookie List. Plus, they are joined by the plant-based duo behind Thug Kitchen and Candice Kumai, the Queen of Wellness, gets real over a literal plate of free cookies. Alexandra Ansanelli, a prodigy and principal ballerina discusses bowing out at the peak of her prestigious career after realizing there was more to life. Then, Kate and Kathryn rank some seriously failed idioms involving guppies, yuppies and ducks. espnW's Kate Fagan delivered this commencement speech to the University of Colorado Class of 2017 on May 12th, 2017 with Free Cookie in Crime, Kathryn Budig, cheering her on from the audience. Kate Fagan's obsession with lists continues as she permits one new cookie add to her "Standard Cookie List." Also, Kathryn Budig makes a startling admission. Plus, Around the Horn host Tony Reali opens up about his family, life and more. 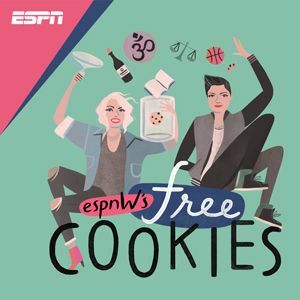 In the pilot episode of "Free Cookies," Kate Fagan and Kathryn Budig chat with Abby Wambach, discuss Kate's obsessions with lists and much more. Kate Fagan and Kathryn Budig talk about what you should expect from Free Cookies.